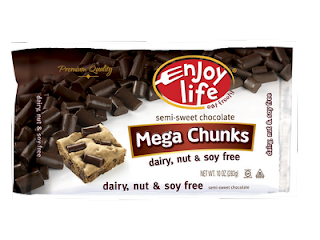 It's no secret that I'm a fan of Enjoy Life Foods, so when they gave me the opportunity to review two of their new products, I leaped at the chance. The Double Chocolate Crunch Granola will have to wait for another day, though, because I couldn't resist starting with the new semi-sweet chocolate Mega Chunks. The chunks are a high quality chocolate made from only three ingredients, evaporated cane juice, natural chocolate liquor (non-alcoholic) and non-dairy cocoa butter, and are manufactured in a dedicated nut and gluten-free facility. Although they are free of all of the "Big 8" allergens, the facility does also process soy and dairy. The equipment, however, is dedicated allergen free, and Enjoy Life routinely tests ingredients for contamination. The Kid absolutely loved the chunks, and our only complaint was that we only had one bag! When I first saw the bag of chunks with the picture of a chocolate chip cookie bar on the front, I'll confess that my first thought was "I want a blondie." Conveniently, there was even a recipe for gluten free "Decadent Blondies" on the back of the bag. Although I will occasionally indulge in some wheatless baking for my local gluten free guinea pigs, I decided to be contrary and immediately moved vegan, nut-free bars to the top of my recipe to-do list. After a few tries, the result was dense, chewy and delicious, satisfying all of my chocolate chip cookie cravings, and creating one of my family's new favorite cookies. Preheat oven to 325°F. Line an 8" by 8" pan with aluminum foil. Combine dry ingredients in a medium bowl, whisk together and set aside. Mix soy milk, sugars and vanilla extract in a small bowl or large measuring cup. Melt margarine, then stir it into the wet ingredients, too. (Mix margarine in last to keep it from clumping up.) Stir wet ingredients into dry, then mix chocolate chunks into cookie dough. Spread the resulting sticky dough into aluminum lined pan. Bake for 33 to 35 minutes and until the edges are slightly browned. Allow to cool completely, then slice into 16 squares. I began with several browned butter chocolate chip cookie recipes when developing these bars, and it's important to use a dairy free margarine with a good flavor. I used Earth Balance Vegan Buttery Sticks. If you don't have an 8" by 8" pan, go ahead and use a 9" by 9", but shorten the bake time to about 30 minutes. The center has an almost marzipan like texture to it, and if there's not a tree nut allergy in your family, these would be absolutely fantastic with almond extract instead of vanilla. Back in my carefree, childless days, I used to occasionally splash some amaretto into chocolate chip cookie dough, and that wouldn't be bad, either! The cookies really do need to cool completely before being sliced, otherwise you'll have an incredibly gooey mess on your hands. Allergy Friendly Friday hosted by Cybele Pascale. I was provided with free samples, but not paid for this review, although I did win the Enjoy Life Cookies for Everyone Sweepstakes a few years ago. My opinions are, as always, my own, though possibly suspect as a self confessed chocoholic. These are the most delicious blondies I have ever seen! That almond extract suggestion also sounds like a good one! Carlyn, good catch on the quantity of margarine! The first batch I made had twice as much, and was very greasy. Lower fat was a happy accident. Please let me know how your full on dairy version turns out! These blondies look like they wouldn't last long around anyone's home! I love the size of those chocolate chunks! So amazing- Both the blondies and the chips! Enjoy Life's mini chips have been my favorite chocolate chips around, so I can't wait to find these larger chunks... No sign of them yet near me, but hopefully it won't be too much longer. These vegan blondies sound amazing! I tried this recipe over the weekend, and my dairy/egg allergic son gobbled them up!! 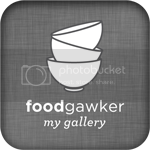 They are fantastic and YOU are amazing... thank you very much for sharing your great recipes and for making life easier. Your blueberry muffins are the perpetual substitute given to my 3 year old when others in his daycare class are eating any baked goods. He loves them... again, thank you. Thanks so much for the kind words everyone! We're really happy that you guys are getting excited about the Mega Chunks. 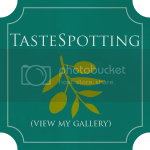 They're very new to the market and appearing in more new stores daily. We hope you will be able to find them near you very soon! I'm having to eliminate soy also, so I tried this with my Earth's Balance Coconut Spread and So Delicious Coconut [Vanilla] milk. I'm changing my diet for the benefit of my 9 month old breastfed (and so we are now learning, allergic) daughter and I'm so used to my traditional baking methods that my extremely picky self was afraid to try any of the sweets I really wanted to eat. These were just amazing! Thick and chewy and great flavor, in my opinion. I can't wait to try these. 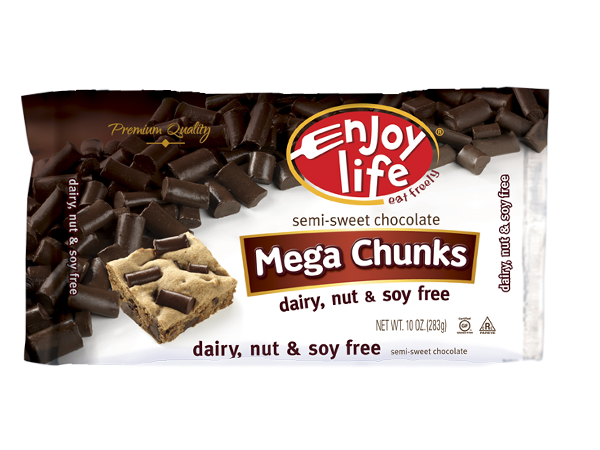 I always use Earth Balance margarine and I recently tried the Enjoy Life Mega Chunks and liked them. I love it when I have the ingredients for a recipe available! One less trip to the store. Thanks. These look amazing! I will give these a try this holiday. Thanks! My grandsons loves these including the non allergic one. I cant find the chocolate chunks in our little town but the mini chips work well too. Thanks for all these wonderful recipes. I was searching the internet for an "eggless" recipe when I came across these blondies. I am not vegan so i used regular milk and semi sweet chocolate chips and they came out absolutely fantastic. so i decided to make them a second time and replace the butter with applesauce (even less fat!!) and they were excellent, a tiny bit "cake"-ier, but almost identical to your original recipe. I added raisins to my second attempt as well. PERFECT! this is one of the best recipes I have found in a long time. thank you so much. I found I needed a longer cooking time though...mine took like 40 minutes. I loved your recipe, your blueberry muffins are perpetual substitute given to my 3-year old when others in his daycare class. Hi Emily, it's not a stupid question at all! There were several reasons. Blondies have a lovely toothsome chewiness that a thinner cookie just can't achieve. The huge chocolate chunks worked much better in these deep dish cookies, too. The little squares are also perfect for slipping into lunch boxes. Mostly, though, the dough is just too sticky to be scooped into individual cookies without incredible aggravation. You can think of blondies (and some other bars) as the lazy person's cookie! Just put the blondies in the oven...mmmmm they look delish! The consistancy was cookie like and i added caramel bits and white chocolate in mine because i cant have the caffine in chocolate. Hopefully they turn out as good as the picture :) and i know they will! Preheat oven to 350º F. In a large mixing bowl combine oat flour, flour, baking powder, baking soda, salt, & cinnamon. In a medium bowl, whisk pureed beans, fruit puree, brown sugar, juice & vanilla extract. Pour wet mixture into dry mixture and stir just until combined. If dough seems too dry, add 1-2 T juice to the mixture. Stir in the chips. Spread in to an 8 x 8 pan. Bake 20-25 minutes, until edges are just turning light brown and middle is firm. These are really yummy, however, mine turned out more like a scone or muffin consistency. This will be great for brunches or breakfast but I'm wondering what I may have done wrong to not get the chewyness of a Blondie. Any suggestions! Hi Julie! It sounds as if your fat/flour ratio is off. Are you stirring your flour and then dipping your measuring cup into it? That will give you the most accurate measurement. Packing flour into the cup will give your too much of it. Did you use tub margarine instead of stick margarine or shortening? The tub margarine has water in it, so isn't appropriate for cooking or baking. Finally, you should also use an oven thermometer to make sure your temperature isn't too high, since that can dry them out a bit. I hope this helps! Hi , I just loved your recipe . Waiting to try it . Just one question . Will these blondies be gooey or they will be cakey . Hi Shama, they are definitely on the gooey side, but firm up nicely as they cool. I just made these and they are delicious! Like a cakey chocolate chip cookie! I replaced the melted margarine with canola oil and used all brown sugar. These two substitutions were fine. But I would like to make these again with the margarine as I think it would give them a more buttery taste. I also made them in a muffin pan with cupcake liners and this also worked great, making them easy to serve and perfect for a picnic! Thanks for the recipe! how many 'muffins' did the recipe make? Count me (no allergies, just vegan) as another fan of these. I reduced the chocolate chips to half a cup and added a half cup of pecans, because when you blank out in Costco and end up with a two-pound bag of pecans in your cart, among other random things, you need to figure out ways to use them. I love that these don't need a cup of margarine/oil and have traditional ingredients (no garbanzo beans, no date syrup, no powdered chia, no sweet potato puree; not that there's anything wrong with that, but trying to make baked goods healthier is living in denial). The dough/batter (doughter? battough?) was a touch on the dry side so I did add a drizzle of canola oil. I probably could have added more soy milk instead.